Are you students struggling with the memorization of their multiplication facts? 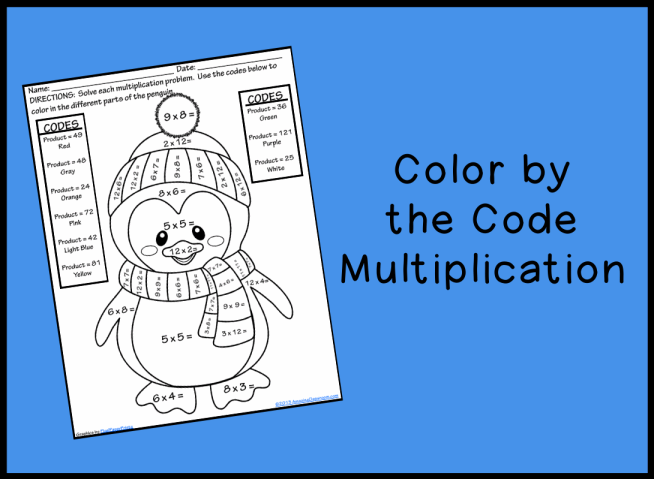 Use this color by the code multiplication activity to reinforce the difficult multiplication problems to memorize. This sheet includes the problems: 6x4, 8x3, 12x2, 6x8, 3x12, 9x7, 6x6, 12x3, 4x4, 9x4, 5x6, 8x5,4x10, and 2x15. Use this for homework, independent practice, or center/station work in math. This is a cute picture of a fox, sun, sky, and grass. Enjoy! 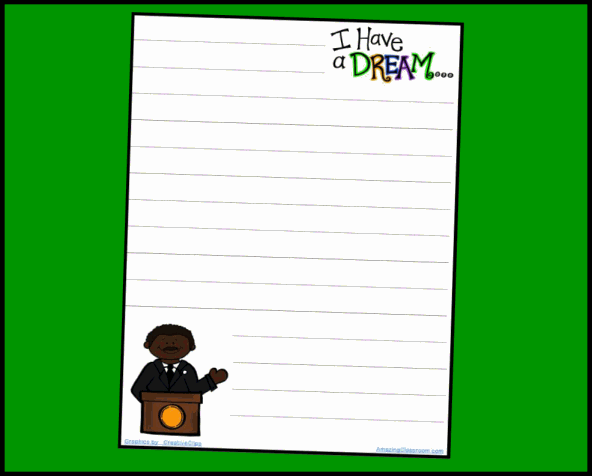 A colleague of mine needed some MLK writing paper. After I created it for her, I thought others might need it too! Clipart was purchased and licensed by the talented Krista Wallden at Creative Clips Digital Clip Art! I hope you all can you this with your kiddos too! Enjoy! Are you students struggling with the memorization of their multiplication facts? 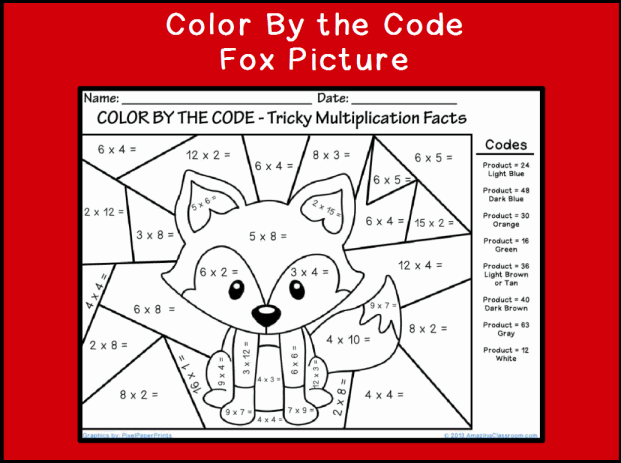 Use this color by the code multiplication activity to reinforce the difficult multiplication problems to memorize. This sheet includes the problems: 6x4, 8x3, 12x2, 7x6, 3x12, 9x9, 6x6, 12x3, 6x12, 9x8, 11x11, 12x4. 7x7, and 6x8. Use this for homework, independent practice, or center/station work in math. Enjoy! 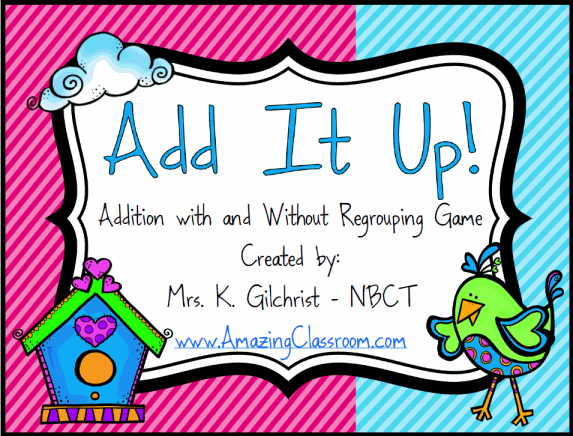 Your students will have a blast playing this addition with and without regrouping game. Students take turns drawing 4 to 8 cards, depending on difficulty. Then, they create addition problems with the cards they drew. Partners check each others' answers with a calculator. If they are correct, they get to keep their cards, if incorrect, the cards go back into the pile. Play a desired number of rounds. The student with the most cards wins! Enjoy! 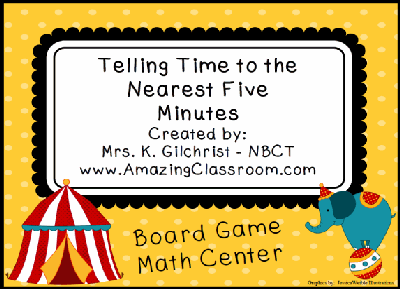 Your students will have a blast getting practice with telling time to the nearest five minutes with this fun math center/station. This math board game includes: A cover for a manilla envelope, setup instructions, directions, a spinner, game board, 24 telling time game cards, a common core state standards sheet to lay out while the students are playing and an answer key. This game is perfect for your students to review telling time! Enjoy! 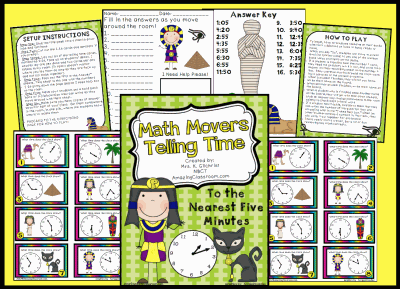 This telling time to the five minutes math movers game is perfect for telling time review for your entire class. Get them up and moving with this colorful, fun, and engaging game. Students move around the room to read the clocks on each of the cards. This telling time to the nearest five minutes game focuses on reading analog clocks and writing down the time shown on each of the faces. Enjoy! 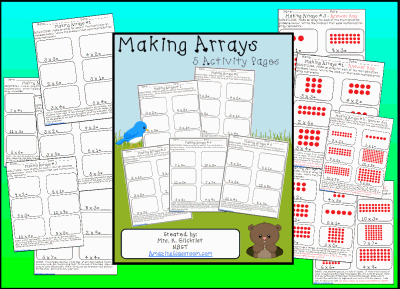 This worksheet pack includes a set of 5 making arrays worksheets. For each worksheet, the students have to make 6 arrays that represent the multiplication problem given. The students also have to solve one word problem on each page by drawing the array, and writing the multiplication expression and the product. There are a total of 35 questions (30 arrays and 5 word problems). An answer key is also provided for easy grading. Enjoy! Do your students struggle with using proper conventions, spelling, and correct grammar? 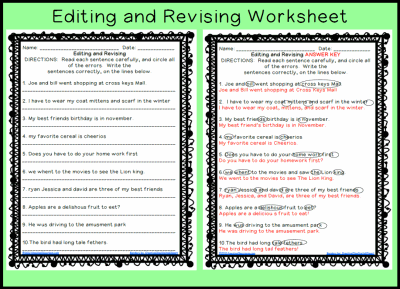 This worksheet contains 10 sentences that your students have to correct. After students identify the errors by circling them, they have to write the sentence correctly. 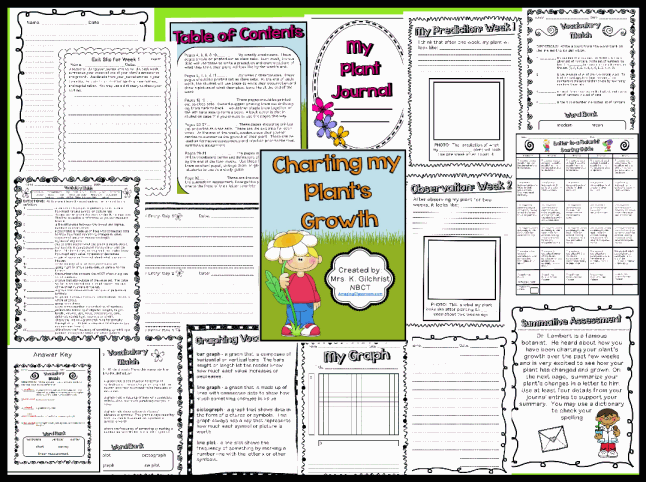 Use as a formative assessment, homework, guided practice, or even as a quiz. An answer key is provided for easy grading. Enjoy! 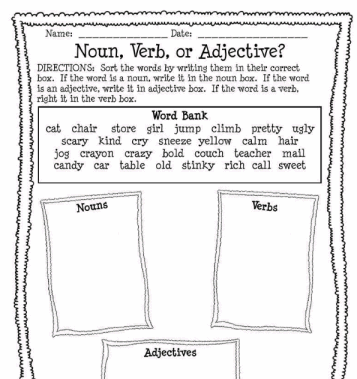 Do your students know the difference between nouns, verbs, and adjectives? Use this sorting activity as an informal assessment to see what they know. You could also use it as homework or guided practice. Students sort the words from the word bank into their proper categories. An answer key is included for easy grading. Enjoy!